Whay is the internal resistance of a voltage source? Voltage sources, whether batteries, generators, etc., are not ideal (perfect). 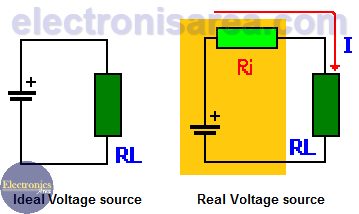 A real voltage source is composed of an ideal voltage source in series with a resistance called internal resistance. This resistance does not really exist so that we can see it. It is a resistance deduced by the behavior of the real voltage sources. See the diagrams of the ideal voltage source and the actual voltage source below. VI = Internal resistance voltage. VL = Load resistance voltage. Taking the following values: I = 4 Amperes, RI = 3 Ohms, RL = 5 Ohms. The total voltage drop will be: VI + VL = 12 V + 20 V = 32 Volts (equal to the voltage of the ideal source) (Kirchhoff voltage law). It can be clearly seen that only 20 of the 32 volts are applied to the load (RL), the remaining voltage is lost in the internal resistance. Frequently this voltage (VL = 20 volts) is called terminal voltage, because it is measured at the terminals of the voltage source. How is internal resistance obtained? If VNL = 12 volts, VL = 11.8 volts and I = 10 Amperes, then the internal resistance is RI = (12V – 11.8V) / 10A = 0.02 ohms. If the electric current I grows to 25 amps (meaning that the load resistor have a smaller value), the load voltage is : VL = 20 volts – (25 amps x 0.02 ohms) = 11.5 volts. We can conclude that, the more electric current the load (RL) demands, the lower the terminal voltage due to the greater voltage drop in the internal resistance (RI). 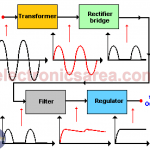 Power transfer between a voltage source and a load is at its most efficient when the resistance of the load matches the internal resistance of the voltage source.